You Get the Nipper Sharpening System with its 110v Motor (for usa machines) (220v European Motor for International) Foot Controller, Both Clamps (clamp A and clamp B) you also get the "Y" Slide, you get One Diamond sharpening disk, and a Standard Cloth Abrasive sharpening disk. that has extra paper disks, it also comes with two 40 minute detailed instructional DVD's that shows you how to sharpen nippers using the Nipper Sharpening system, an Anvil and a Spacer. The Diamond Sharpening Disk will last approximately 1,500 to 3,000 nipper sharpenings (IF used Properly) and the Standard Abrasive Disk will last approximately 800 to 1,200 nipper sharpenings. We keep in stock and sell the Replacement Sharpening Disks. 12"x12"x12" box weighing approximately 21 pounds. Your always welcome to come to our OHIO facility and take FREE hands on Training . Training is done by appointment only. We are located in Ohio but only 15 miles from Wheeling WV and 1hour 15 minutes from Pittsburgh International Airport in Pittsburgh PA.
We do make the Nipper Machine in a European 220v motor as a SPECIAL ORDER MACHINE. If you want to order a 220v European Nipper machine you may have a little longer wait, it is a special order. 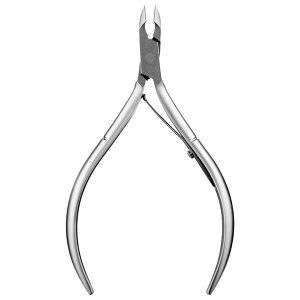 Our company saw the need to design a specialized sharpening system for the cuticle and podiatry nipper instruments. Nippers are not like shears/scissors in the fact that nipper edges meet each other exact, while shears and scissors the blades by-pass each other. Nipper sharpening is more of a detailed oriented sharpening process. Our company felt that doing the nipper sharpening by hand with a file creates inconsistency in sharpening from nipper to nipper. Our Nipper Sharpening System sharpens both sides of the nipper edge at the same degrees. This gives the nippers edges a more consistent and even sharpening process. You do still have to tighten (or loosen) your nipper jaws at the pivot point but the actual nipper edge sharpening is being sharpened at the same angle on both inside edges of the nipper, this give the sharpening its consistency. Weekends and ALL Holidays are NOT Considered a Business DAY, So Please Remember this when Placing a Machine Order. All Orders for Machines will take 14 Business Days to ship.